Lalatia Varian is an Imperial priestess serving as Oracle in the Imperial Cult at the Chapels in Ebonheart. She is one of the highest ranking members of the Cult in Vvardenfell, second only to Ruccia Conician. Lalatia is the highest ranking member you will ever need to speak with, however, as Ruccia is preoccupied representing the Imperial Cult on the Grand Council of Vvardenfell. She is the one who sends you on all of the later quests for the Cult. As well, she sells potions, spells, and spellmaking services to members of the Cult of rank Acolyte or higher. Lalatia wears an expensive robe and shoes. She carries up to 40 gold. Aside from her natural charm and ability to absorb fatigue from others, she knows a selection of spells from the schools of Illusion, Mysticism, and Restoration. Specifically, these are the same spells that she has for sale. Boots of the Apostle: "When Talos Stormcrown was a young man in Skyrim, he went into the mountains to learn the secrets of the Greybeards. He learned the secrets of the high peak winds -- the roar of the winter blast, and the warm silk of the summer updrafts. When he descended from the mountains, he came riding the clouds, striding through the air in great boots he claimed were gifts of the Greybeards for his cunning craft and riddling. After Septim yielded his crown, the boots disappeared, and have been lost for many years." Ice Blade of the Monarch "The Evil Archmage Almion Celmo of the Summerset Isles created the blade for a warrior, Thurgnarr Assi, who was to assassinate a king. The assassination failed, Thurgnarr Assi was slain, Almion Celmo was imprisoned, and the Ice Blade fell into the hands of a series of malefactors. The weapon is a claymore enchanted to cause frost damage, and is rumored to pass from owner to owner of its own volition"
Ring of the Wind: "The Ring of the Wind is a legendary treasure of Elsweyr, sacred to Kynareth. It was owned by the nimble acrobat Kisimba Spring-Snow, who was said to always land on her feet, except when she chose to land on the feet of others." 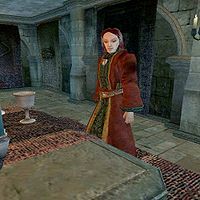 Lalatia Varian also appears in the Houses of Morrowind card expansion for Legends as the card Ebonheart Oracle.